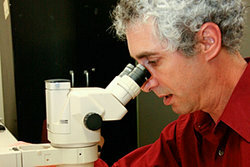 Professor and chair of the anthropology department Jack Rossen loves to dig into history. He came to work with the Cayuga through his interest in local archaeology and history. He and associate professor Brooke Hansen co-founded the Native American Studies minor, a multidimensional program that includes special events, field trips, internship opportunities, and student recruitment. Their Anthropological Experience in Hawaii field class takes students to the Big Island of Hawai'i to work in a taro patch and ethnobotanical garden, and learn about the ancient lifeways and modern struggles for respect and sovereignty. This summer I took my second Archaeological Field School course at Ithaca College, led by Professor Jack Rossen, head of the anthropology department. 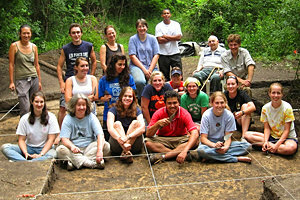 On an unplowed and undisturbed piece of farmland in Levanna, New York, near the northeast side of Cayuga Lake, 11 students mostly from IC and Tompkins Cortland Community College (which cosponsored the course) helped Professor Rossen unearth a Native American village dating from the 900s. Amazingly it was well preserved just a few inches under the forest floor. Levanna, as the site is called, was a Cayuga village. The Cayuga are part of the Haudenosaunee, better known as the Iroquois Confederacy. One thousand years ago the Cayuga dwelled on the land surrounding Cayuga Lake, including modern-day Ithaca. Digging in a 2-by-1-meter hole might not sound exciting, but I loved it, and with the approval of the Cayuga Nation, our class helped to reshape and reclaim their past, which has up until now been told primarily from a Western perspective. 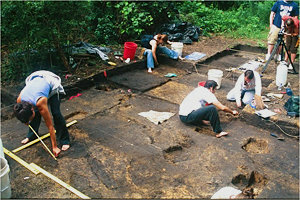 Professor Rossen has been at the forefront of restructuring relations between Native Americans and archaeologists, working to bring direct involvement with the descendant community, in this case the Cayuga, into the archaeological investigation. That first pipe bowl and the more than 100,000 artifacts subsequently recovered help to piece together a new understanding of the Cayuga history and the roots which connect Cayuga people today to their ancestors who lived in this area over a thousand years ago. Meeting chiefs and clan mothers, who share equally in the leadership of the Cayuga Nation, taught me of the undying respect the Cayuga hold for their past and emphasized the importance of our excavations. It also showed me how much more advanced Cayuga culture was than Western culture in terms of gender equality. Long before American women had the right to vote, Cayuga women were equals within the Nation, and the clan mothers hand-selected chiefs to represent their clan within the longhouse. The Native Americans visiting the site during excavation led me to understand not only the historical significance of the site, but also the spiritual power embodied within it, and the powerful entities held within the artifacts that were being uncovered daily. As I was working one day, an Onondaga faith keeper toured the site, then sat on a log in long silence next to my excavation square. What became obvious to me through his reverence of the site is that the artifacts are not solely artifacts but are messages from the Cayuga past working to teach us what has been lost to time. Now I see that the innate winged design fragments of herringbone ceramics that I unearthed so often are a cultural transmission from mother to daughter that has carried on to Cayuga potters of this day. Now, Levanna has been backfilled, and all there is to see are patches of grass. Yet the learning and discovery continue. After the dig, I worked on soil flotation to identify the plant remains at the site. 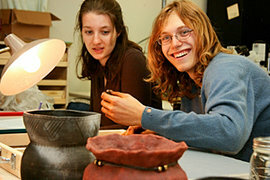 And in last fall’s Archaeology Laboratory course, Professor Rossen taught us a variety of techniques to use in analyzing the Levanna artifacts. Given the vast number of artifacts and the different avenues that will be explored, the analysis is likely to continue for several years to come.